It’s been a couple months since Bing announced “Image collections” - essentially allowing users searching for images on Bing to see related Pinterest boards alongside regular search results. Unfortunately, we're no closer to understanding how Bing ranks these "Pinners" than before, but there are some observations to be made. For the unfamiliar, here's an example of "Image collections" in action. 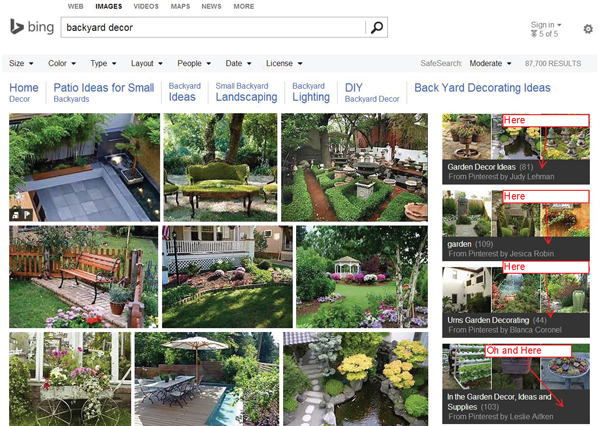 When a user searches for “backyard decor” under the “Images” tab on Bing, it will result in a right-hand column of results from Pinterest (see image), but what makes these featured “pinners” so special? That's a good question. There are other pinners with similarly titled boards who have as many (if not more followers and pins) than those featured in the results. What's more interesting is that other pinners even have "exact-match" Pinboards ("backyard decor"), but boards titled "Garden Decor Ideas" or "Urns Garden Decorating" show up instead. Perhaps, however, they key is in engagement. Bing may rank boards higher based on their author's authority, which could be calculated by the numbers of likes or re-pins they receive. All four pinners Bing featured in the image results regularly receive re-pins and likes but never really topping double digits and it’s generally re-purposed (not original pins). So what gives (err pins)?